Oberheim OB-SX "What makes the OB-SX so impressive" 1-page colour advertisement from page 23 in the December 1980 issue of Contemporary Keyboard. Want to know what makes the OB-SX so impressive? For a start - it is in *colour*. I believe this is the first Oberheim advertisement in CK to appear in colour. Can you believe it?!?! And this is their second "First" for 1980! The first "First" being that their first two-page CK ad appeared in the March 1980 issue - the OB-X "Evolution of a classic" ad. Also impressive - the photo used in this ad. Up close and personal. You can even make out the surface texture. Almost feel it! The only disappointment is that you don't see the OB-SX logo on the synth. I love that big fat font with the slightly larger "S". The ad-title font comes close, but just doesn't do the actual logo full-on justice. 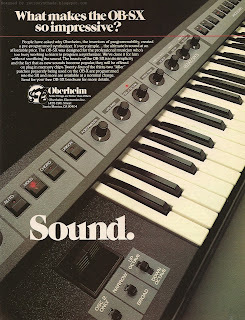 The ad-copy is impressive in that it is short and sweet - not typical for Oberheim. With the main ad theme being "Sound", Oberheim again pushes the OB-SX as the keyboard for the "professional musician" who's too busy working to learn to program. It's excellent positioning, and I'm sure played well with their main audience. Interestingly, they continue to mention that other sounds are available on chips, but gone is the original offer to customize memory chips if a user sends in a cassette dump from their OB-X. I mentioned this in my last post, but I gotta say it again. 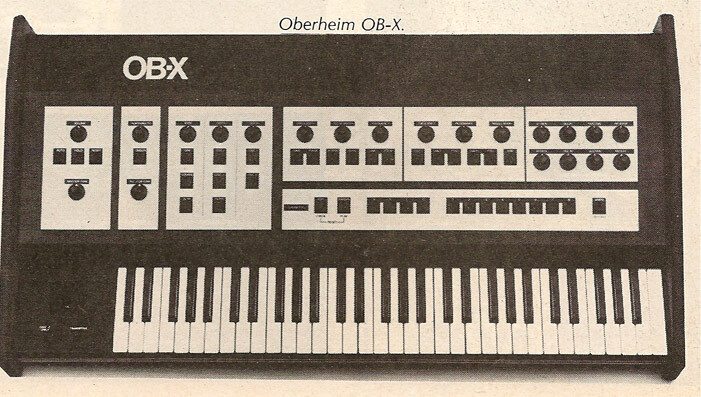 I really think Oberheim missed an opportunity by not pushing the custom chip angle more, explaining that musicians could program their OB-X in the studio, and then get the custom roms made of their patches to take on the road inside the much cheaper OB-SX. Maybe it just wasn't cost-effective to make the custom chips, or, not many people took advantage of the opportunity. Boo. "...the instrument pictured in this intro ad is most likely a prototype or pre-production unit because it looks a little bit different from the "regular" OB-SX. To begin with, it has less knobs/controls on the front panel, and the OB-X logo is in a different position." How did I miss that, especially with all the comparisons I've been making with the different OB-Xs in a recent post!?!? Gah! In a follow-up email exchange with Micke, he provided more detail on OB-Xs, OB-SXs, and beyond. I'll be including a lot of that information in a future post or three (a lot of info! ), but some of that OB-X and OB-SX info fits perfectly in this blog post. First, Micke pointed out that, in fact, the first OB-Xs off the production line did have what I called the "normal" font logo on them. I had included a progression of OB-X photos in that last blog post, the first of which was from Contemporary Keyboard's '79 NAMM article - and the one I suggested might be a prototype. Notice OB-X logo in top right in 'normal' font. If this is your photo, let me know. I can remove or give you full credit! "To the best of my knowledge the first two digits indicate the year of manufacture; The 2nd and the 3rd digits indicate in which week of the year it was made, and finally the last two digits refer to the number of units built in a given week. Thus, the OB-X with S/N #793504 was the 4th unit built in the 35th week (the last week of aug) of 1979. " b) a relatively small number of OB-X's with the "old-look" were shipped from the factory. " Now that's some detective work. And, we now know there was only a few months of production time before the final version of the OB-X started shipping. Although that is some awesome OB-X info, what does this have to do with the OB-SX - the instrument featured in this ad? Not much... yet. But, if you recall from my last blog post on the OB-SX, I'm kinda obsessed with Oberheim's computer port, a kinda pre-MIDI type connector that let Oberheim instruments sync to each other, and which later was officially labeled by Oberheim as "The System"! In that OB-SX post, I had suggested that the computer port was available on the OB-SX from the start since it was listed in that introductory ad - bringing the introduction of "The System" all the way back to mid-1980. And now Micke has provided information letting me know this port was ALSO available on the last batch of OB-Xs that came out roughly the same time as the OB-SX. To be more precise, the port appeared on the OB-Xs starting in the first week of September 1980 with serial #803600! I <3 that computer port. End note: Micke referenced that last batch of OB-Xs as "Rev 4", a term you evidently won't find in any official Oberheim info. According to Micke, "Rev 1-4" designations were created by a guy named Tony Clark who had a Web page dedicated to the OB-X and that "he created these designations purely for the purpose of identifying the age of the OB-X in question. According to Clark there's no reference to a rev 1, 2, 3 or 4 in any Oberheim documentation." If you find it, let me know!